I thought all of this was pretty bold to begin with, but then I saw that they were also handing out postcards featuring the beverage! After enjoying a delicious dinner and draining the 24oz glass, I have to say this Bloody was pretty darn good…but BEST? That’s a pretty bold statement. Spice: It had a little kick to it. Chaser: Yes—I choose a cider! 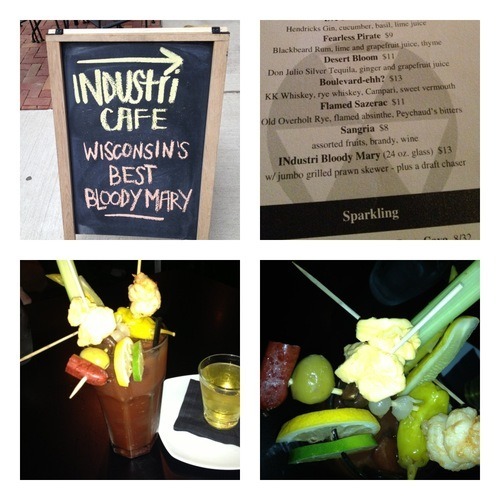 This was a delicious Bloody and I’ll definitely be back to Industri, but I’m a little hesitant to bestow any awards. For one, it’s pretty pricey compared to most (although it is almost the size of two drinks) and two, while they had a lot of fixin’s, I felt they could have been a little more creative….And I was not a fan of the deep-fried prawn, I would have preferred a skewer of raw shrimp instead. 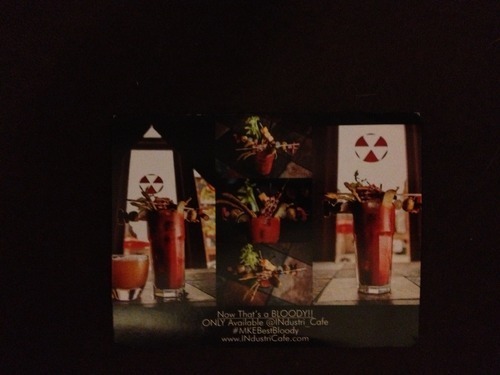 If you love Bloodies, you should definitely put this on your list and make your own decisions!